"Professor Banks concentrates his book on interviews with middle class black women, who he says are the most likely to be unwed of any group in the country..."
"Feminist leader Gloria Steinem knew just how to piss off and intimidate white men in power when she showed up in Newsweek, at the start of the Women’s Liberation Movement, with her “boyfriend,” the very dark, handsome, well-sculpted, black Olympic star Rafer Johnson." I read this book years ago. Forgot the gist of it but it's quite fitting because years earlier me and some other people were in a panel discussion with some Black people from England and we were discussing the marital and relationship problems that Black people face both in the United States and the United Kingdom and how similar they are and some of the younger ones mentioned a program there that asked "Is marriage for White people". 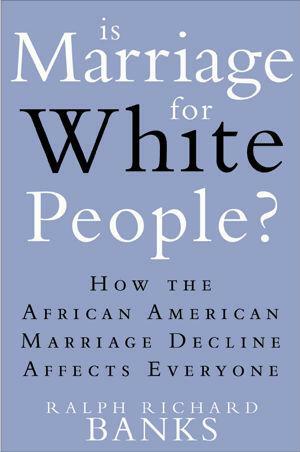 I don't think marriage itself is for White people, but the TYPE of marriage (monogamous) that is instituted and re-enforced in the West IS for White people because it works best for them. Just like the nuclear family structure that is so common in the West works best for them; while I believe the extended family and group family structure is best for our people as AfroAmericans.